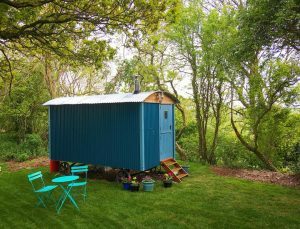 Free Range Escapes – Escape to the beautiful wilderness of the North Cornish coast. 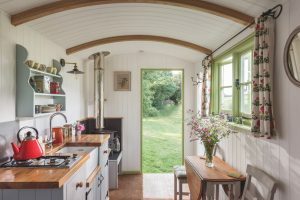 Stay in a handcrafted shepherd's hut on a converted railway line and relax. 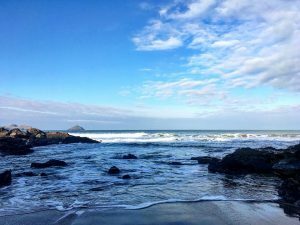 Escape to the beautiful wilderness of the North Cornish coast. 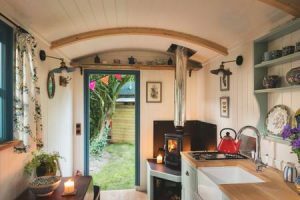 Stay in a handcrafted shepherd's hut on a converted railway line and relax. 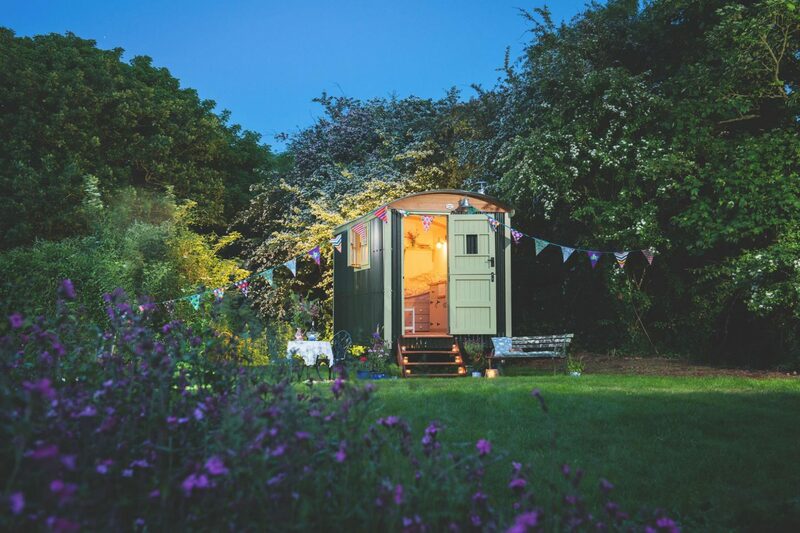 Escape to the beautiful wilderness of the North Cornish coast, close to Port Isaac & Polzeath. 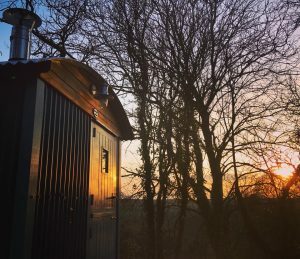 Stay in a handcrafted shepherd’s hut with curved ash beams & Windy Smithy wood burner on a converted railway line. You can relax in total privacy with only the local cows for company. You can explore the nearby woods, go swimming, fishing & boating on the magical freshwater lake. A perfect break for couples or a solo traveller wanting to unwind. 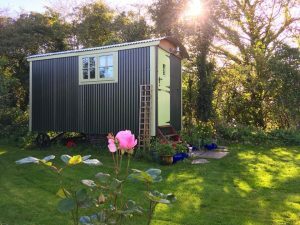 Free Range Escapes was create because of a need to escape the hectic life of the city! 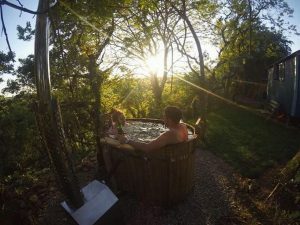 For people who want and love to surround themselves in nature and the elements but who sometimes like or deserve a little with more comfort than just basic camping. 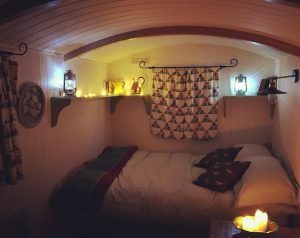 Our Shepherd’s Huts are based at Cornish Tipi Holidays/Weddings also known as Tregildrans Quarry. The site is unique. A woodland valley folded around a clear, spring-fed lake created from the old quarry. 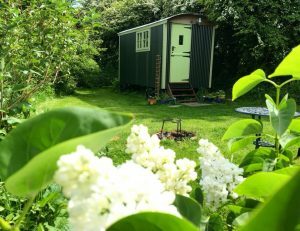 The hut is at the top of a secret 20 acres clothed in ferns and bluebells, oak and meadowsweet. Undisturbed by modern agrochemicals and herbicides the natural ecosystem has flourished, providing a thriving habitat for flowers and butterflies, birds and mammals. 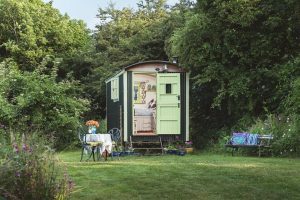 The Shepherd’s Huts are situated in a recently reclaimed part of the site on the old railway line which was taken out in the 60’s, reclaimed by nature until now! 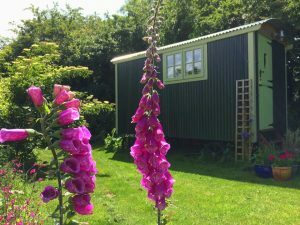 At Free Range Escapes you are a five minute drive from some of the prettiest villages and most spectacular coastline in Cornwall. 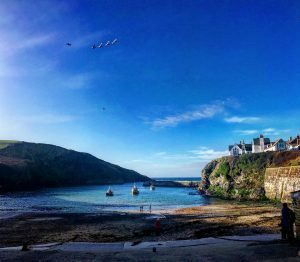 You can buy fresh mackerel, scallops and crab in the fish cellars at Port Isaac within 10 minutes of leaving your Shepherd’s Hut, go sea kayaking under soaring cliffs at Port Quin or take a surfing class on Polzeath’s trend setting shoreline. 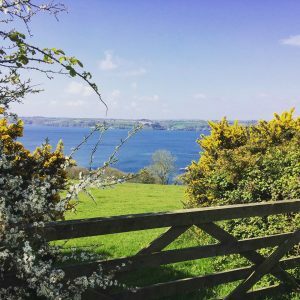 We have some phenomenal walking right on our doorstep; the Cornwall Coastal Footpath, the Saints’ Way, but unfortunately a car is still usually needed to get you there. 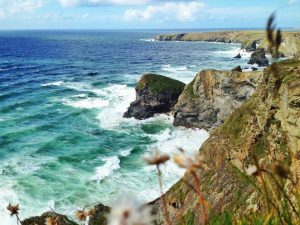 15 minutes up the coast brings you to Tintagel Castle and the ancient village of Boscastle, and the same distance inland lets you walk the rugged solitude of Bodmin Moor. 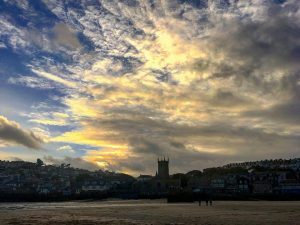 We have a variety of good shops, pubs and restaurants in the area including the now nationally famous Seafood Restaurant in Padstow – book a return with the late water taxi across the moonlit estuary from Rock for a special evening out. You can go on fishing trips, bird watching walks, sea safaris, sailing and windsurfing courses, learn to ride, golf, play tennis, see a touring theatre production, work in watercolours, take a master class in seafood cookery, explore Cornish history, attend a music or literary festival, or just go cycling together on the beaufiful Camel Trail nearby. 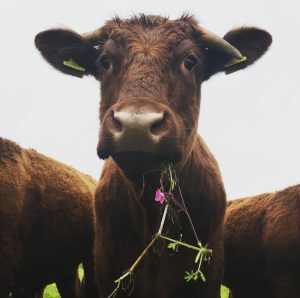 Having your own transport is advised because of the rural location, although we have had walkers stay who were exploring the North Cornish Coastal Footpath and they loved it! The nearest bus stops are Port Gaverne, Port Isaac, St.Kew, Trelill or St.Teath – buses operate on a hail & stop basis. They will often stop on the main road and let passengers get off if you give them prior warning. Prices range from £65.00 -£120.00 per night. With a minimum stay of 2 nights. 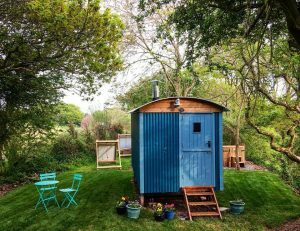 We now have two Shepherd’s Huts at Free Range Escapes. 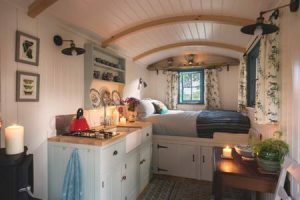 Both set on the re-wilded Railway Line at Cornish Tipis also known as Tregildrans Quarry. The site is unique. A woodland valley folded around a clear, spring-fed lake created from the old quarry. 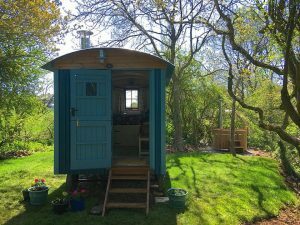 The hut is at the top of a secret 20 acres clothed in ferns and bluebells, oak and meadowsweet. Undisturbed by modern agrochemicals and herbicides the natural ecosystem has flourished, providing a thriving habitat for flowers and butterflies, birds and mammals. 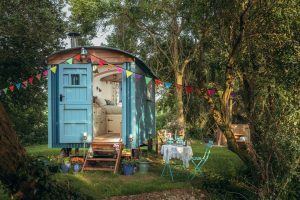 The Shepherd’s Hut themselves are situated in a recently reclaimed part of the site on the old railway line which was taken out in the 60’s, reclaimed by nature until now! Guests will have full access to the whole site & all its faculties. 20 acres of woodland to explore and a freshwater lake to swim, boat and fish in. As well as your own secluded garden space complete with an open fire and garden furniture. 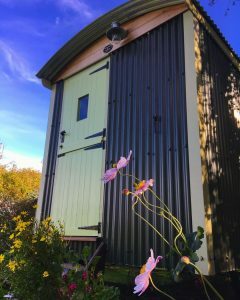 The huts have their own private compositing loo and wooden shower shed (made partly from pallets) both outside. Guests are of course allowed full access to any of the other loo/shower blocks on site. There is also electricity in both huts!! Solar powered lights & sockets make it easy to charge items or read a book after the sun goes down. However please be aware that the electricity system in the hut can only take up to 300 watts. This means it is fine for charging phones, cameras, laptops etc. but unless they are low wattage (most aren’t) hair dryers, hair straighteners & electric kettles will trip the system. Anything that requires a huge amount of electricity i.e. heating devices please do not use. 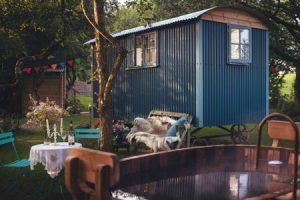 Both huts are fully equipped with a comfy double bed, a kitchen area complete with cutlery and kitchen equipment, there is no fridge just a cool box – ice blocks can be collected daily. 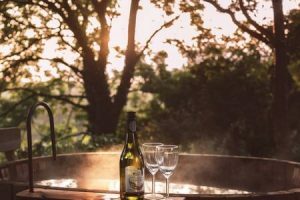 The aim is to have created spaces which make you feel like you are out in nature & the elements but with more comfort than basic camping. 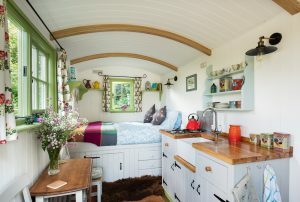 Guests should also note that the Shepherd’s Huts have no fridge. There is a cool box under the sink – fresh frozen ice blocks can be collected daily from the main car park just outside the wood clad reception/little shop. There is also only a starter amount of wood provided under the wood burners, so more wood maybe required. This can be purchased on site or you can bring some with you or you can really get back to basics and forage in the woods! Escape to the beautiful wilderness of the North Cornish coast, close to Port Isaac & Polzeath. 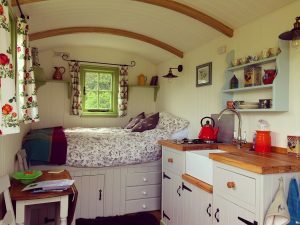 Stay in a handcrafted shepherd's hut with curved ash beams & Windy Smithy wood burner on a converted railway line. You can relax in total privacy with only the local cows for company. You can explore the nearby woods, go swimming, fishing & boating on the magical freshwater lake. A perfect break for couples or a solo traveller wanting to unwind. 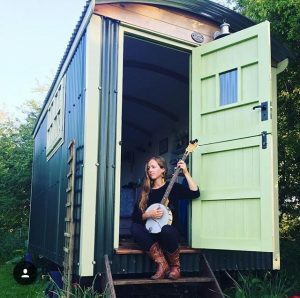 For updates like us @freerangeescapes on Facebook & Instagram.